As many of you may recall from your attendance at a pre-registration informational meeting, we recommend that most students take at least 6 terms to complete the massage program. This recommendation is based on the fact that you are developing not only new skills but also new sensory awareness, and it takes time to hone those skills and that new awareness before entering into massage practice. We understand that some students have a relevant academic or health care background, or even come to us with experience practicing massage in other places, and may move through the program at a faster pace. Additionally, some students are managing very busy lives and full-time employment while attending school, and they may move through more slowly. The fact that we have an open entry-open exit program means that students are afforded endless options regarding how they arrange classes and at what pace they complete them. This flexibility is generally a significant advantage to our program, compared to others that lock students into very strict scheduling. However, it also means that students may face increased scheduling conflicts as they mold the program around their lives, because class and instructor scheduling can only be organized to avoid conflicts based on one “ideal” plan. We feel the 6-term plan best balances students’ desires to become licensed and begin their practice with the need to give new knowledge, skills, and senses some time to develop. 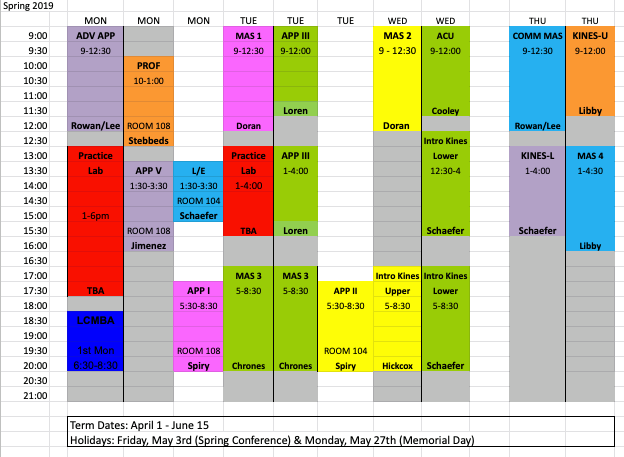 Therefore, that is the plan on which we base our class scheduling. Unfortunately, this means that if you have completed classes outside of that plan’s recommendations, you may face some scheduling challenges as you move through the program. We understand that it can be frustrating when scheduling dictates, for example, that you extend your education by one term to complete just a single class… But we also hope you can understand how hard we work to reconcile instructor schedules (after all, our instructors are all working practitioners with busy lives!) with both student needs and the functional capacity of classroom availability. As enrollment at Lane increases, and more credit classes are held in the Downtown Center, our scheduling will become ever more constricted. Please refer to the 6-term plan as you plot your course through the program, and know that, despite our best efforts, any other plan may not be so well accommodated by scheduling. We will continue to do our part to try to meet students’ needs (a day/night class rotation, for instance), and are always brainstorming about how we can further improve both the massage program as a whole and our support to students specifically! Thank you all for your curiosity, passion, and desire to learn!